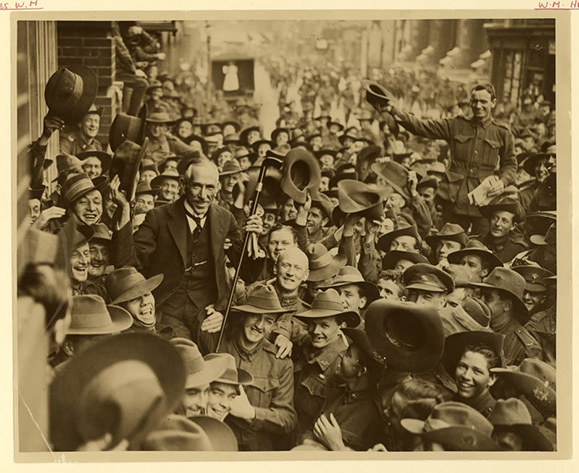 Prime Minister William “Billy” Hughes’ defeat at the 1916 conscription referendum nearly ended his career. He was expelled from his party, but managed to retain the leadership by convincing 23 colleagues to join his newly formed United Labor Party. 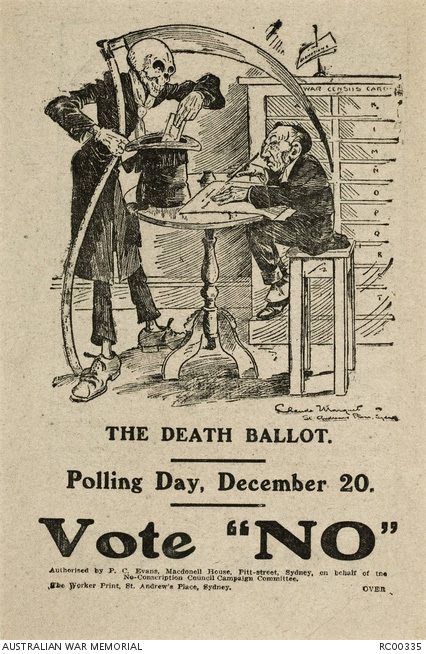 The outcome of the 1916 referendum also did little to ease the pressure from the British Government. In addition to keeping the five existing divisions fully manned, in 1917 the British also tasked the Australian Government with forming a sixth division. On 7 November 1917, Prime Minister Hughes announced he would again put the question of conscription to the Australian public. 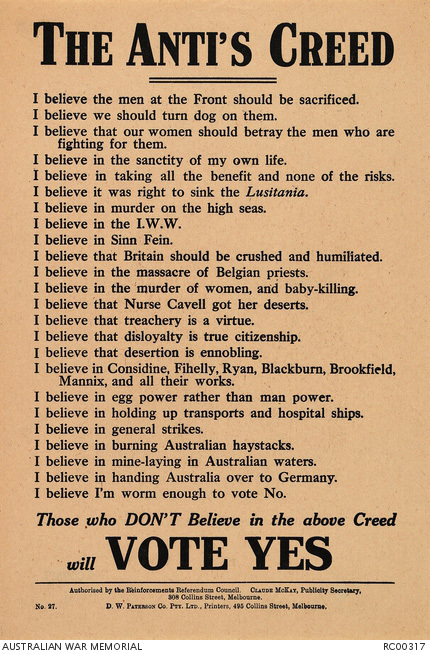 While he had the majority in both houses of parliament and could enact the necessary legislation without a referendum, Hughes wanted to give the Australian public the chance to “right the wrongs” of the 1916 outcome. Despite the controversy over conscription, many troops were supportive of Prime Minister William Hughes and even nicknamed him “the little digger”. National Archives of Australia. Under Hughes’ updated proposal, voluntary enlistment would continue but any shortfall would be made up by 20 to 44 year old single men, widowers, and divorcees without dependents, who would be called up by ballot. Are you in favour of the proposal of the Commonwealth Government for reinforcing the Commonwealth Forces overseas? While there was only six weeks between the announcement and the vote, the debate in this period reached a fever pitch and lead to some truly extraordinary scenes. 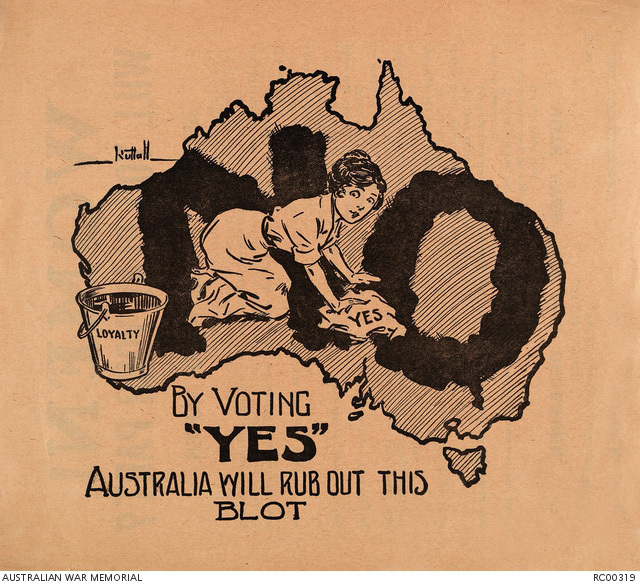 When Australians went to the polls on 20 December 1917, the proposal for conscription was again defeated, this time with a more significant margin of 46% for and 54% against. Turnout for this second referendum was greater than in any previous referenda. 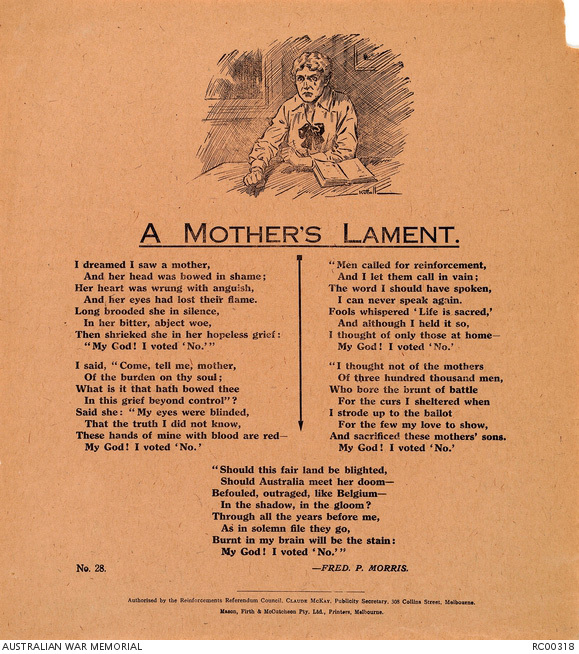 As in 1916, the many sensational pamphlets, fliers and leaflets distributed in the lead up to the 1917 referendum give an insight into how emotionally-charged the debate had become. 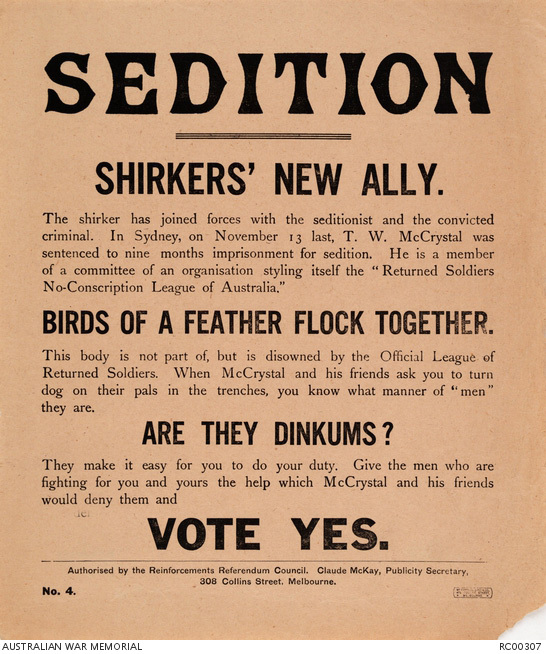 Second conscription referendum leaflets and pamphlets, Australian War Memorial. Queensland Premier Thomas Ryan was a leading force in the anti-conscription campaign. While he supported Australia’s involvement in the war and the need for reinforcements, he believed men should not be forced to enlist – and was the only state leader at the time to say so openly. 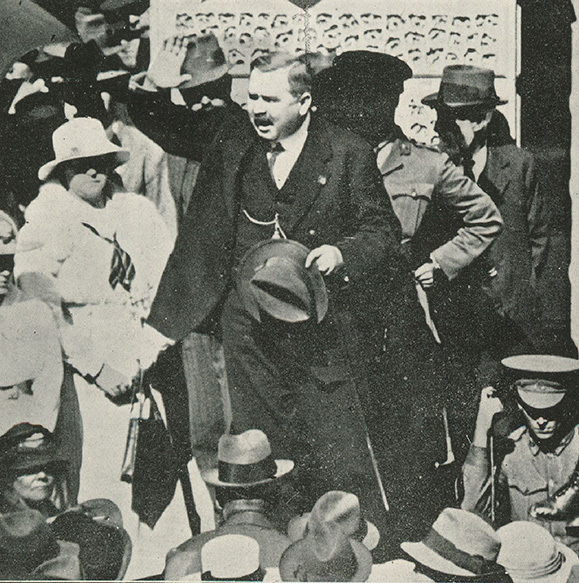 Premier Ryan gave an impassioned speech outlining his anti-conscription views at a public meeting on 19 November 1917. Prime Minister Hughes reacted by forbidding anyone from printing or distributing copies of the speech. Ryan countered on 22 November by re-reading the censored content within Queensland Parliament so it would be recorded in Hansard. He also planned to have 10,000 copies printed and made available to the public. An incensed Hughes retaliated by ordering a military raid on the Queensland Government Printing Office, intending to confiscate and destroy all copies of the speech. This resulted in a tense standoff between state police and Commonwealth officers on the steps of the Printing Office, and a drawn out legal stoush between Hughes and Ryan. Premier Ryan was against conscription, but not the war. He is shown here encouraging men to voluntarily enlist in 1918. State Library of Queensland. Perhaps to counter Premier Ryan’s vocal anti-conscription position, Prime Minister Hughes visited southern Queensland in the weeks leading up to the vote. The most memorable incident of this tour occurred at Warwick, Queensland on 29 November 1917. Sources differ on what actually occurred during Hughes’ speech. The mildest accounts describe how Hughes had his hat knocked off by a lone thrown egg. The most lurid accounts describe Hughes being pelted with a volley of eggs, leading to a violent struggle involving men armed with hammers and heavy tools. Two brothers, Barth and Patrick Brosnan, were identified as the source of the trouble. However, despite the urging of the Prime Minister, the local police wouldn’t arrest the pair, stating that they had not broken any state laws. In response to what he saw as rogue actions by the state, Hughes quickly moved to establish a new Commonwealth police force that would uphold Federal authority. Within a fortnight, Hughes appointed his first Commonwealth Police Commissioner to lead the organisation now known as the Australian Federal Police. 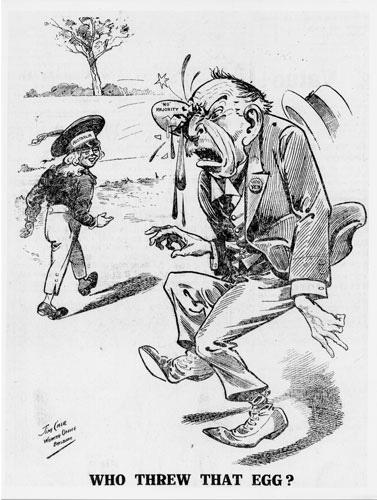 The Warwick egg incident as depicted by a satirical cartoonist. Museum of Australian Democracy. 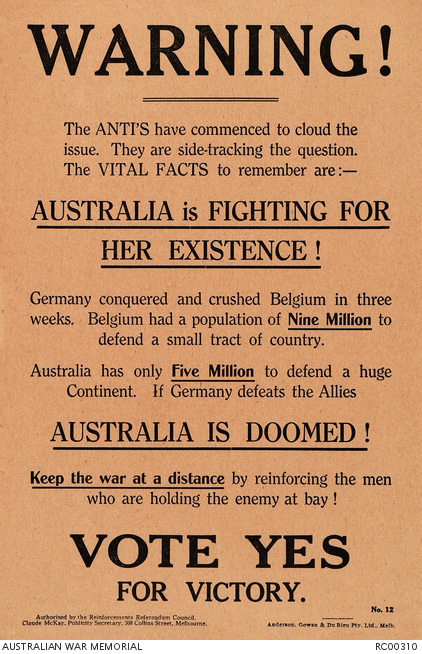 Throughout the debate, most Australians believed that the First World War was a just cause. Opinions generally only differed on whether men should be forced to enlist. 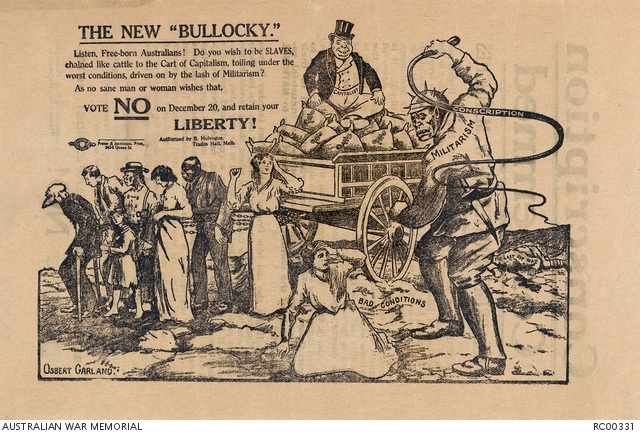 Unlike the first referendum in 1916, people who were born in Germany, Italy and other countries linked to the enemy were not allowed to vote in the second referendum, even if they were Australian citizens. People who could not prove their place of birth were also disqualified. Only three copies of Hansard No. 37, which contains Premier Ryan’s controversial anti-conscription speech, remain today. At the time, supporters for both sides of the debate blamed women for influencing the outcome. It was thought by some that women were too prone to fear and sentimentality. In 1917, women had only held the right to vote for 15 years. 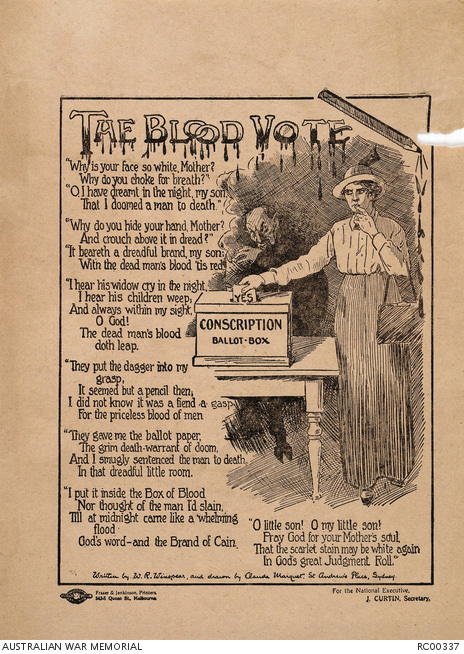 Serving soldiers were permitted to vote in these referenda. In each instance, the majority voted in favour of conscription, however there are reports that these results may have been falsified. Prime Minister Hughes resigned from office on 8 January 1918, keeping his vow that he would leave if the referendum failed. However, as he was not replaced as party leader, the Governor-General swore Hughes in again two days later.